↑ Tadeo, Patrick Everett (29 March 2013). "Do the Thais Know Something That We Don't?". Top Gear Philippines. สืบค้นเมื่อ 3 June 2013. ↑ "Factory Facilities". honda.com.my. สืบค้นเมื่อ 30 March 2016. 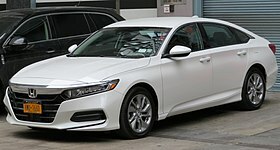 ↑ "Honda Accord: The Ninth Generation". adandp.medi. สืบค้นเมื่อ 30 March 2016. ↑ "2018 Honda Accord World Debut" (Press release). American Honda Motor. 14 July 2017. สืบค้นเมื่อ 15 July 2017. ↑ Rosevear, John (18 October 2017). "Honda Sharpens Its All-New 2018 Accord to Steal SUV Sales". The Motley Fool. สืบค้นเมื่อ 3 December 2017. ↑ "Completely Redesigned 2018 Honda Accord to Arrive At Dealerships This Fall". Cambridge Centre Honda. 6 October 2017. สืบค้นเมื่อ 3 December 2017. หน้านี้แก้ไขล่าสุดเมื่อวันที่ 2 เมษายน 2562 เวลา 16:56 น.